So I went on a little trip. Took the peeps. Just got home. I’ll be back to tell you all about it. See if you can find me easily in this little photo. Boy, were there ever some smells in that forest! This entry was posted in The Scottie Chronicles and tagged dogs, pets, The Scottie Chronicles, traveling with a dog. Bookmark the permalink. is that you right in the middle, Stu? Off your leash?? Mum never lets me off the leash – she swears she’ll never get me back if she does. What can I say? Off lead – good job! We couldn’t be trusted especially with all the smells. We’re glad you can take the peeps out and about every so often. I’m sure they appreciate it. That takes HER back. 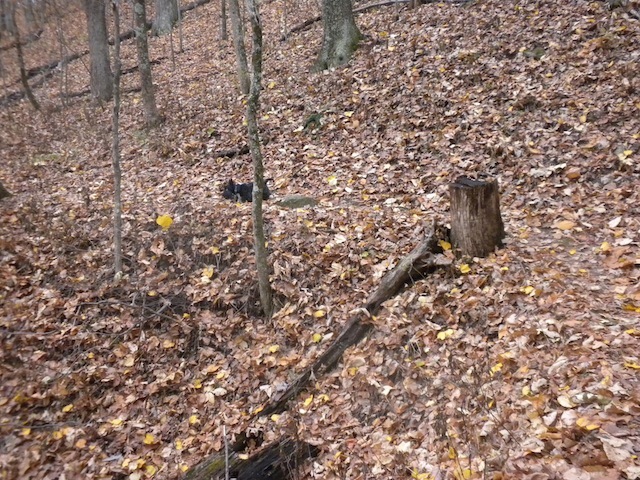 Love those leaf littered woods…. I found ya right away Stuart. Me, too!! I sees ya, Stuart!! Dat looks like a pawsome place fur sniffin’!! Any zombies out dere? Good impression of a tree stump, Stu. I thought you’d find me. Were you the one who knocked down that tree? ‘Fess up. What a lot of leaves!! They were falling from the sky! HaHa! Not where’s Wally? Where’s Stuart? Such a good and interesting place to sniff Stuart. Forests are great…..so many smells like you said – evidence of animals of all sorts…..great sniffing and hiking in woods……we have a small woods behind our house. I find all kinds of “stuff” down there! All kinds of stuff indeed! Lots of bunny bon bons! Pippi loves “marking” her way through a hike. Oh yes! Give her a hug from me, OK? Oh we see you on that pawsome trail!